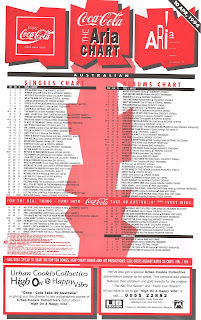 It was one of those weeks again on the ARIA chart this week in 1994 - yep, it's time for another round of less successful singles by acts that had bigger hits. The week's four new entries on the top 50 were by artists with higher-charting singles to their name, while many of the song that peaked between 51 and 100 were disappointments for acts that had or would achieve better. Things couldn't - and wouldn't - get any better for East 17, who remained at number 1 with "It's Alright", which had now racked up its sixth week on top. This lead single from Let Love In was the best performing release by Nick Cave & The Bad Seeds to date, while the album became their first top 10. Things would get even better in 1995 for them. Another (very different) Australian band that'd break through in a major way in 1995 got the ball rolling with this EP led by "Everything I Do From Now On Is Going To Be Funky". Number 86 "Gangsta Lean" by D.R.S. This American R&B group, who received help landing their record deal from MC Hammer, hit the US top 5 with this debut single (and title track of their album) but had no such luck locally. The first taste of Morrissey's fourth album, Vauxhall And I, returned him to the UK top 10 for the first time since 1989, but it was the latest in a long line of songs not to breach the Australian top 50. "Green Limousine" had provided the Australian band with their biggest hit under their own steam, but this fourth and final single from Get On Board became the album's least successful. Now this song really should have done better. An original track that was just as good as the band's cover of "Tears Of A Clown", "Roundabout" just couldn't get past number 63, reaching that peak three separate times during its chart run. "The Key: The Secret" and "Feels Like Heaven" had been two of the best pop/dance tracks of 1993, but I pretty much agree with the lacklustre performance of this third single from the UK group. "Sail Away" is not a bad song, but it just doesn't measure up to either their earlier two releases or upcoming single "High On A Happy Vibe" and album track "Yours Is The Love". I relatively recently rediscovered the High On A Happy Vibe album, which is a pretty solid set of songs - pity Urban Cookie Collective ran out of steam by releasing the wrong song at this juncture. "Can We Talk" was still inside the top 20, and wouldn't actually reach its peak of number 12 until the following week, but that earlier single was joined on the top 50 by the title track of teen singer Tevin Campbell's second album. Another smooth R&B mid-tempo tune written and produced by Babyface and Daryl Simmons, "I'm Ready" would end up falling just shy of the top 20. In the US, it matched the number 9 peak of "Can We Talk". Australia was going k.d. lang crazy at this point, with the Canadian singer's tour of Australia prompting Ingénue to soar into the top 5 last week and her next album, the soundtrack to Even Cowgirls Get The Blues, to be on its way to a top 10 spot. "Hush Sweet Lover" was taken from the latter and ended up charting higher than her only other top 50 single to date, "Constant Craving", which had also re-entered the top 100 a year after it finally became a hit in Australia and is the song for which k.d. is much better known. An even bigger single would come in 1995, while perhaps her most iconic song would finally chart (and become her most successful hit) in 2010. Still at number 13 after 17 weeks on the top 50, "Slave To The Music" was shaping up to be one of 1994's biggest singles and would end the year as the 12th biggest hit. Even so, I still found it a bit basic. And as for this follow-up, it really was a low rent version of Eurodance as far as I was concerned, with none of the edge of the Dutch group's contemporaries. Still, enough Australians liked - and bought - it to give Twenty 4 Seven a second top 20 hit. This would be their final top 50 appearance, however, and we'll see their chart career in Australia peter out over the coming months. Next week: some more less successful follow-ups to big hits, plus the arrival of a dance smash by a group that would chart under a couple of different names. I actually didn't mind "Gangsta Lean" -- I must have seen it on Power Cuts, or Video Hits, or one of those other non-Rage shows. Rage probably never played it since it got nowhere near the top 50. This was a memorable (in a bad way) week for 15 year old me: it was the week Kurt Cobain died, and there was I on a school camp far from civilization in rural Western Australia, with no TV, no newspapers, and no radio. There was nothing else to do but listen to Nirvana on my Walkman and feel sad!